Here are a few tools for approaching friends, voters and congresspeople and giving presentations. 1. A tri-fold flyer that could be useful for seeding the ideas raised in this website and blog is here: flyer – state-owned bank 12-09. 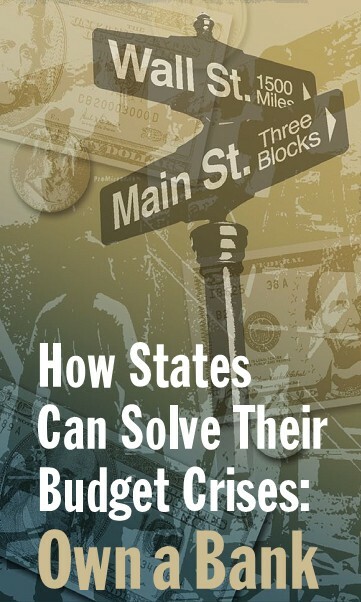 How States Can Solve Their Budget Crises: Own a Bank. Front and back can be printed on a single sheet of paper. Fold between the three columns. 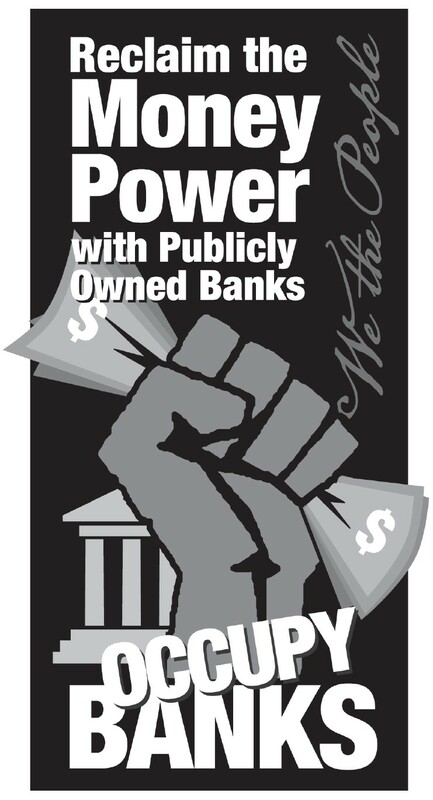 Reclaim the MONEY POWER with Publicly Owned Banks: OCCUPY BANKS. 2. A power point presentation on the state bank option is here: state bank pp 8-09. It can be adapted to suit, but the cartoons and charts are drawn from the Internet and could be copyrighted, so use for educational purposes only please. Update: A power point presentation for a state bank for Washington State, created by Dennis Eros, is here: State Bank for Washington, 26-Feb-2010. Update: Ellen Brown’s presentation on a state bank for California is here: “How California Can Create its Own Credit: Own a Bank,” 14-Aug-2010. Update: Ellen Brown’s presentation on a state bank for California is here (presentation given 9-Dec-2010, in San Rafael, CA: “How California Can Create its Own Credit: OWN A BANK!,” 9-Dec-2010. Update: PBI (Public Banking Institute) presentation on a state-owned banks is here (presentation given 16-Apr-2011, in Lummi Island, WA: “How States Can Create their Own Credit: OWN A BANK!,” 16-Apr-2011. Update: A presentation by Ellen Brown at the University of Washington, in Seattle, WA, October 11, 2011: “The Public Option in Banking,” 11-Oct-2011. Update: A presentation by Ellen Brown at the Public Banking Institute’s inaugural Conference in Philadelphia, PA, April 27-28, 2012: “From Austerity to Prosperity with Publicly-Owned Banks,” 27-Apr-2012. Update: A presentation by Ellen Brown to the RSA (Royal Society for the encouragement of Arts, Manufactures and Commerce) Scotland, 22 November 2012: “A Public Bank for Scotland?,” 22-Nov-2012. Update: A presentation by Ellen Brown at the 3rd Annual World Conference on Riba, 26-27 November 2012: “Public Banking: Making Money Work for the People, 26/27-Nov-2012. Update: A presentation by Ellen Brown to the Public Banking Forum of Ireland, 12-15 October 2013: “The Irish Debt Crisis: Time to Think Outside the Box,” 12-15 October 2013. 3. For an excellent tutorial with live charts on how banking really works, including capital and reserve requirements and fractional reserve lending, see “Banking and Money,” http://www.khanacademy.org. The reason for a state owned bank is simple – we have lost control of our finances. Our municipalities are burdened with legacy debt and aging infrastructure and the only way to fix the infrastructure is to bond through Wall Street. We can’t take any more taxes, but indebting us to Wall Street has cost us dearly and the costs will only increase as the national credit crunch continues to squeeze us at home and in our neighborhoods. Our businesses are also suffering from the credit crunch. National banks are canceling lines of credit for businesses with excellent credit ratings. Shopping centers are emptying out, and it seems like another friend loses his or her job every week. As for the future – it’s bleak. Credit is all but drying up as scare resources get diverted to bail out Wall Street. A state bank, capitalized by our own taxpayers, would allow us to fund commercial development, mortgages, municipal debt, mortgages and student loans. Fortunately, we have a model. North Dakota has had a state bank since 1919 and this year the state has a $1 billion plus surplus! I urge you to support legislation to create a state bank today. 5. Create your own correspondence! A suggested draft that one can edit, change, or revise is here. 6. Include recent articles on public banking in your correspondences. Recent relevant news articles can be found here and those by Ellen Brown can be found here. 7. Sign this petition for a California state bank here. In 8 years, the greatest ECONOMIC IDEA ever to hit America could come to fruition! The Goal: To be out of debt in the United States and have global prosperity. In eight years, that one seed of rice planted in the White House Garden will produce 214 grains of rice. If they are planted in the spring of 2010 and all the grain is harvested and planted for seven years, then in the Fall of 2017 the United States will have 4 quintillion, 398 quadrillion, 556 trillion, 620 billion, 369 million, 714 thousand and 700 hundred grains of rice. Divide that by 20,000, the number of grains it takes to make a pound, and you have 219,927,831,018,485 lbs of grain. Say in 2017, rice is valued at a $1.00 a pound. The total value of the grain would be $220 Trillion. Now that truly is greater than what any man made derivative or credit swap can produce. It’s truly powerful. It’s Mother Nature’s bank yielding plenty. As a sovereign nation, the President or Congress can create “The Bank of the Greater United States” collateralized by “seed money” with the stroke of a pen and a few thousand newly employed people to manage, help plant, and harvest the grain. Currently the National debt is $12 Trillion. $220 TRILLION in 2016 could be enough to pay off the ever-increasing debt. (If not plant more seeds!) The new incoming President in 2017 would inherit a debt free country! Now that is a totally NEW ECONOMIC IDEA! All the current President has to do is plant one seed today…. BUT WHY WAIT….If the President doesn’t PLANT IT….what about YOU? You could plant one seed of rice to yield plenty and create real value for yourself and others. On a massive scale the world population would prosper! Plant 214 grains in the second year you will harvest 45,796 grains. ·	369 million, 714 thousand and 700 hundred grains. The math is 4,398,556,620,369,714,700 divided by 20,000 equals 219,927,831,018,485. So at about a $1.00 per pound (in 2017), the grain will yield 219 trillion, 927 billion, 831 million, 18 thousand, 485 dollars. I rounded it off to $220 trillion. (My Calculations show that in the eighth year, only 3 million acres would need to be planted)…Hell there are 171,904, 640 acres in Texas! ·	$220 TRILLION could be enough to pay off the debt with a bit of pocket change for implementation AND give the incoming President in 2018 a debt free country. If not plant more seeds! You could to yield plenty and ultimate prosperity to be shared around the world. Contact me at 617-964-2951 or davidsnieckus@hotmail.com and we will work out the details. I just read your latest HuffPost article on the war between GS and JPMorgan and the manipulation of markets by GS. I recently checked the Michigan CAFR and found out that the retirement fund for public school employees had fallen from $49 billion in 2007 to $35 billion in 2009. And the market hasn’t really even crashed yet! It makes me sick to think that my neighbor’s pension (schoolteacher since 1968) is in the hands of criminals and incompetents. I agree. I was just going to write on the CAFRs, and how they might be better invested in the equity of a state-owned bank. Then they could be leveraged many times over into loans. I came across this video, yesterday, by George Hunt, that left me with the impression that the “Banking Elite” already have the above “New World Bank” ready to set into motion. George Hunt, a business consultant, was present at the 1987 Fourth World Wilderness Congress as a member of the staff. At the conference he noticed it had very little to do with the conventional environment movement. In attendance he was surprised to see people like Maurice Strong, Edmund de Rothschild, David Rockefeller & James A. Baker. Ellen,lets everybody put our 2 cents together,and start our own national credit union/common good treasury. We don`t need the gov.We learn to vote,we can learn to invest.God help those that help themselfs. Gaining our financial independance through state owned banks is a phenominal idea and should be persued in earnest. However, there is one caveat that should be addressed; the failed business model of conventional banking practices. Conventional banking practices? Demand accounts, checking and savings: Can consumers continue to deposit their hard earned income into accounts that provide nothing in return to the depositor? Long/short term amortized debt:? Low rate and low payment look good in the budget, but these are annuities. If we continue to fund some one else’s annuities how can we fund our own? Diversified debt: A mortgage or two, a car payment or two and a credit card or two; the diverisfication of rate, terms, repayment demands and the monthly payments themselves are consuming too much of the consumers paycheck. Do the analysis. Do the research, if you have the means. This business model is failed and broken. Reform banking if you’d like, but it has taken 70 years for the current model to expose itself as inadequate and inefficient. The answer? Self banking within the current banking envirnoment. I am not here to promote my own business, but it is the only business of its kind that kind demonstrate and validate the incredible power of self banking. Using the tools currently available, in the proper sequence can provide the financial freedom, control and authority we all seek and demand. We have helped hundreds of American families achieve a level of financial success they would have never realized or achieved under the current model. Monthly cash flow has improved 75-100% over conventional practice. Debt balances have declined 25-75% faster than conventional practice dictates. Retirement portfolios have grown substantially compared to the monthly nickle and dime contributions currently available by the virtue of conventional practice. Relying on the national banking model or a state owned banking will only produce a marginal result for the consumer, the fuel to the whole machine, if we continue to operate under a failed model. If we continue to do what we have always done we will continue to achieve the same results. The strength of the institution is contingent upon the strength of the consumers. A strong institution does not make a strong consumer. If we want future generations to flourish financially we need to flourish financially today. that would be needed would be a proper introduction to the issue. They could be a truly powerful ally. would not take action without a lot of feedback. Let’s hear about it. I am thoroughly fascinated by the photo on page 26 of a Bank of Pennsylvania ? – I don’t know what to call it – note? I can’t read it very well but it looks like numbers were filled in in ink by hand, and there are blanks on this piece of paper that look like they are supposed to be filled in by hand. I’ve been trying unsuccessfully to locate a book or article that will explain in detail how the system represented by this photo worked. Can you refer me? Also, did you try the references in Ellen’s book, “Web of Debt”? I, myself, haven’t looked yet. Thanks Ann! That .pdf looks great! And I have looked for references in Ellen’s book but I can check again. I’ve read the .pdf now and I don’t see any info that explains how that “Bank of Pennsylvania” note or whatever it was worked. I’m beginning to suspect it was a stock certificate and not an example of the fiat currency issued by colonial government. This opens up a can of worms! hi – this is an excellent website. I am from England and want to do the same sort of thing as you are over there in America. I know it s an enormous project and I was wondering if you know how it i will be different for the UK to have a similar capaign..
Can we force our politicians in Ellen Brown’s and my state of California by passing a proposition, then having the people vote on it in some November? Like Label GMO and Prop 13 of years in the past? I believe others states in the U.S. also have this liberty-OR?etc. Please advise every member and supporter of the Public Banking Institute that the Code of Practice project – will be reported on by the Canada Chapter of PBI at the AGM June 3-5. Public Banking offers the best hope for community standards of common law application of Criminal Code rules against deception in the sale of securities – to replace the “industry standard” of self-regulation. This is one of the most salient arguments in favour of public banking – and if PBI can develop a code of practice that articulates this principal, then the value of public banking will be greatly clarified in the public mind. Please consider providing input to this Code of Practice project. Investors who have been disillusioned by the rampant tolerance for bad faith business practices under the SRO model – are waiting for a banking and investment standard that will restore trustworthiness. We, as supporters of the public interest, need to do our part to restore the viability of investment in solid and reality-based investment instruments – that are completely free of all deceptions. If we provide the model for this, the economy will have its foundations made much more functional. Your input is greatly welcomed at: “canadachapterpbi@gmail.com”.